You can see by the chart that the Paul McBeth putter (LUNA) took the top spot by a large margin. Considering how much he threw it in the Las Vegas Challenge (see his first round throws here) it is not surprising that the putter had a big spotlight on it. Other McBeth signature discs, and Discraft in general, ruled the chart last week. The Axiom Plasma Fireball was a new plastic release that pushed that disc to the number two spot. Fans of the limited edition Axiom and MVP releases tend to break down the doors on the weeks when those are released. 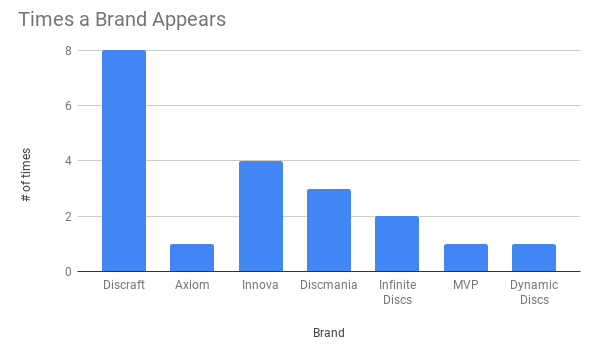 You’ll see the MVP Plasma Axis also made the chart for the same reason. 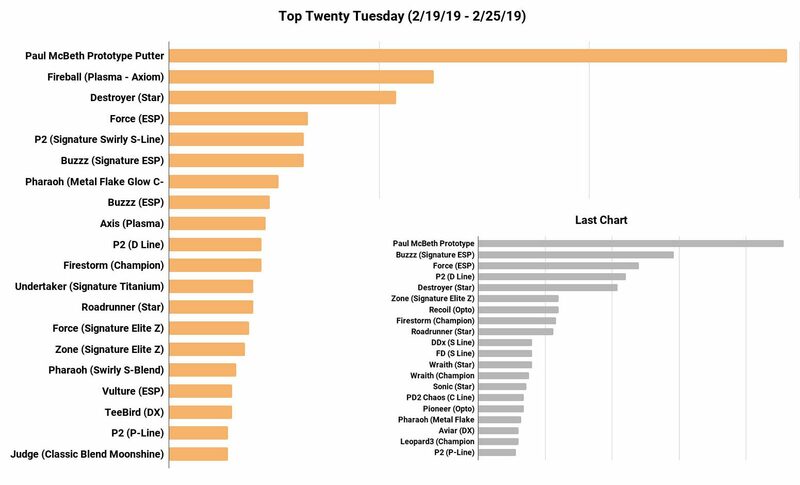 The Infinite Discs Pharaoh moved into two spots on the chart with both the Swirly S-Blend and the popular Metal Flake Glow C-Blend taking the #7 and #16 spots. The Innova Star Destroyer moved from last week’s #5 spot back up to #3. WINNER – It looked like we’d hit a 3rd week without a winner, but one person nailed it, and with a disc that hadn’t hit the previous chart as a new release. Les predicted: “Discmania swirly s line Simon Lizotte Sky God 2 should roll into the #5.” That was right on! Congratulations Les! GIFT CARD PREDICTION FOR NEXT WEEK: Leave your comment below this blog to predict the #6 spot for next week’s chart. Metal Flake Glow C-Blend Pharaoh moves up to #6! Long shot but I am going with the Swirly s-line CD3. Fireball Plasma Axiom will be 6!